Amanda's Parties To Go: Fabulous Christmas Collaboration GIVEAWAY!!! that time to plan holiday parties and find some wonderful ideas for gift-giving. Today, I hope to make that all a little easier on you! Persona Pails and Edible Details! Have you seen the adorable gift pails from Persona Pails? Melinda Tomasello and Pam Grimes, co-founders of Persona Designs, Inc., say they are on a mission to redefine the entire gifting experience. “This is such a feel-good product,” explains Tomasello “we want to put smiles on faces one pail at a time. Here's how it works - each kit comes with all of the essentials. Just peel off the reusable expression stickers to create one of seven different Personas.... or, you can mix and match the stickers to create your own "Persona Original." Attach the hair, pop in a gift, write a special message on the note card and its complete! Not only can it be used as a creative gift container, but also as a centerpiece, party decoration, children's craft activity, keepsake box, or storage container. 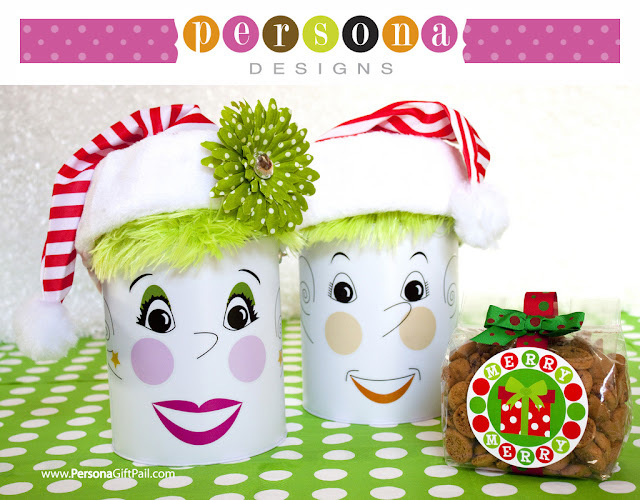 And new for 2011, Persona Designs is offering a fun and festive collection of 8 pre-made holiday character pails, all “dressed up” and filled with mini chocolate chip cookies! But the fun doesn’t stop there – inside each pail, the recipient will receive extra stickers to create ALL 8 heart-warming characters (stickers come on and off for endless possibilities). 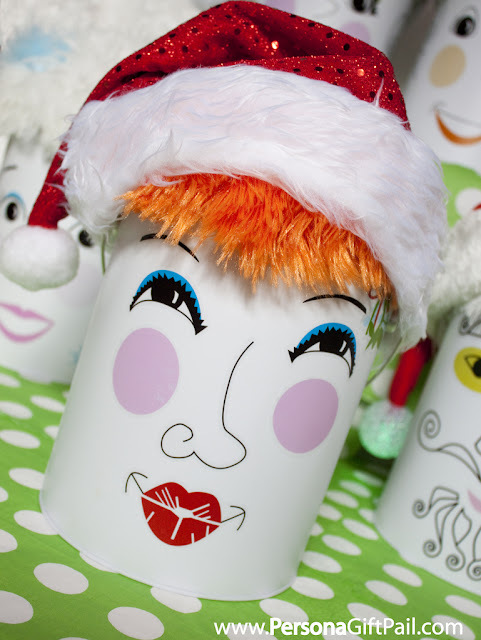 Pails can be reused and recycled for future holiday fun! How fantastic are those little pails! How about a little FONDANT FUN to add to the giveaway? Brittany Rumohr over at Edible Details is offering some of her beautiful fondant designs, too. If you haven't seen Brittany's work, you will be amazed at her sweet, handmade cupcake topper creations that can be custom created to match all party themes. Brittany is a professional pastry chef and graduate of Le Cordon Bleu Culinary Arts School. After working in the cake and cupcake market for three years, Brittany decided to go into business for herself. It has truly become a sweet job thanks to her freedom to work one-on-one with customers to create the perfect cake toppers, 3-D toppers and cake decor for their special occasions. Since her entry into the cake decorating world she has been part of a competing team in two episodes of the hit TLC show “Ultimate Cake Off,” and has been featured in numerous cooking and party planning blogs. Just take a look at some of her adorable designs. Edible Details is always my "go-to" cupcake topper store when I want that extra little something for my dessert tables. Brittany and I have collaborated on many parties together, and she has been an absolute dream to work with. Not only has she made brilliant, perfect copies of my printables graphics in fondant for cupcake toppers, but she is fast on shipping and a real sweetie, too. It's every hostess' dream to entertain without the "stress" that hosting a party can bring about. With the talents of Edible Details, you can have the sweetest little works of art delivered right to your door with no stress and no fuss. Just unwrap the toppers and place them on top on some store bought cupcakes and you're good to go! Now for this little giveaway we can't forget the party printables, can we? Amanda's Parties To Go is participating in this fun, holiday giveaway, too! Party printables are the perfect way to create a stylish party on a budget. The files come straight to your email inbox and are super easy to print and assemble. In no time at all, you can have professionally designed party decorations for your next big celebration. 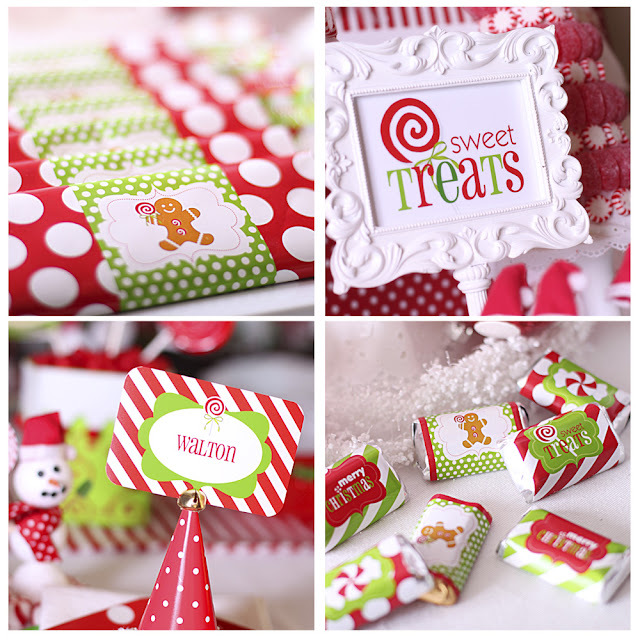 Amanda's Parties' latest holiday printable collection, CANDY CHRISTMAS, has already been a HOT seller. 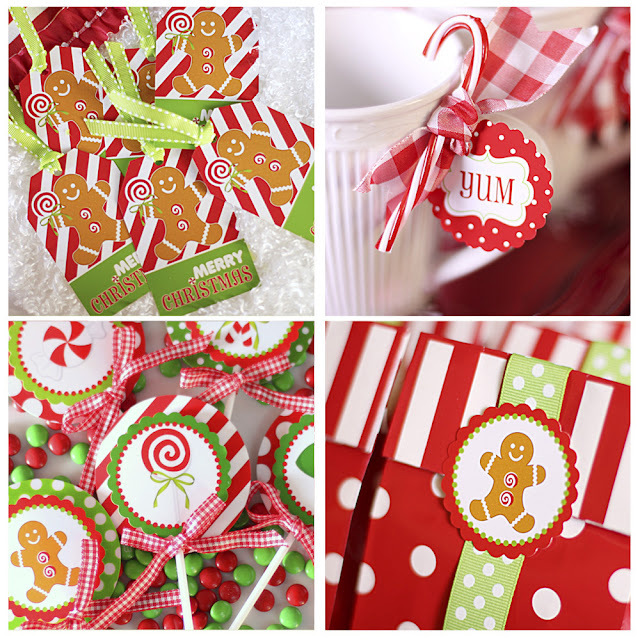 It's chock-full of holiday printables.... cupcake toppers, centerpiece cut outs, candy bar wraps, drink wraps, party signs, favor tags and more! This set is perfect for all your holiday parties, brunches and even for creating one-of-a-kind gifts for your neighbors and friends. And there is a super cute "Cookies and Cocoa" invitation to coordinate, too. Are you ready for the GIVEAWAY?? NOTE: Small parts warning. Not intended for children under the age of 3. DEADLINE TO ENTER IS 11/22/11 AT 11:59PM. OPEN TO US RESIDENTS ONLY. just type in SHINDIG at checkout! So be sure to head on over to Persona Pails and take a look at all of their adorable offerings for Christmas and other Special Occasions, too! May the Merriest Person Win!! Good luck everyone! So fun! Would love to win!! Adorable! Would love to win these fabulous items! Debbie D. - Those are the cutest pails I've seen! I really want to win this. Those cupcake toppers look amazing! My name is Erin Hoyt, erinelizabeth1985@yahoo.com, I really really want these mugs!!! SOOOO Cute!! What a great giveaway!! I love everything!! And I am the merriest!! Such an adorable giveaway!! So hope I win!!! I'm hosting Christmas this year so I could really use this prize. Ohh My Merry Bells! These are absolutely fabulous! I liked Shindig Parties on Facebook. Amazing giveaway and so needed since I will be hosting Christmas Eve AND Christmas dinner at my house! Love your work and I think the banner addition to any party is amazing. really dresses the space and helps with the theme. love it! I like Persona Gift Pails on facebook! I like ShinDig Parties on facebook! I like Edible Details on facebook! What a fun giveaway! I hope I win. Everything is so cute! I hope I win! Liked Shindig Parties to Go! This would indeed make my Christmas Merry! That is a totally adorable combination!! I'm a fan of edible details!!! Like persona designs on fb! Love edible details on fb! Like shindig parties on fb! i like shindig parties TO GO on facebook! So Cute - Looks like I will have to start baking more - Edible's stuff is so awsome - - Hope I win! Awesome giveaway!! I would love to win!! I am a Fan on Edible Details Facebook page! How cute and what a great giveaway just in time for the holidays! I like Edible Details on FB! I like persona designs on FB. I like shindig parties to go on FB. thanks for the contest! this would be great to win! Love the printables!! Would love to have for my Christmas party!! War Eagle! Such a FABULOUS giveaway!!! The pails are rocking! 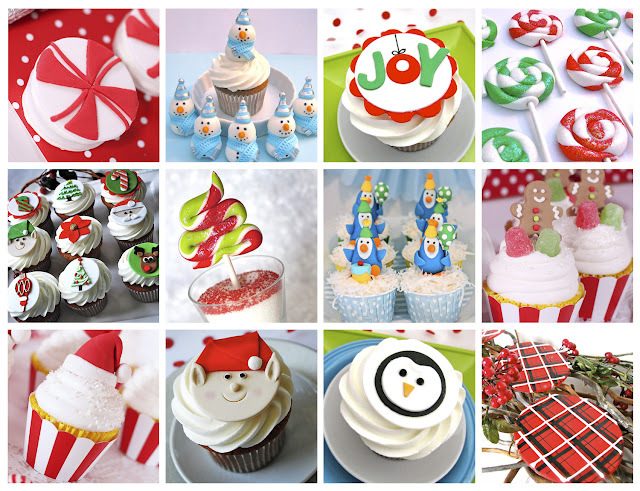 LOVE your printable collection and the fondant toppers are perfect! Man you guys are so creative!!!!! Love everything!! I liked Persona designs on facebook! I am a huge fan of Edible Details already on facebook!!! Left her some love!! I am now a fan of Shindig Parties to Go on facebook! I may not be there merriest! but I would LOVE to win. Thanks for the chance. Great giveaway! I am so excited for the holidays! What an awesome giveaway! I'd love to have this at my holiday party!!! Love them! What a cute giveaway! How creative is this! I'm glad my sister, Ms Holly, shared this link! Of course I already like Shindigz on FB, too! Wow! Love it all! Thanks for hosting this giveaway! 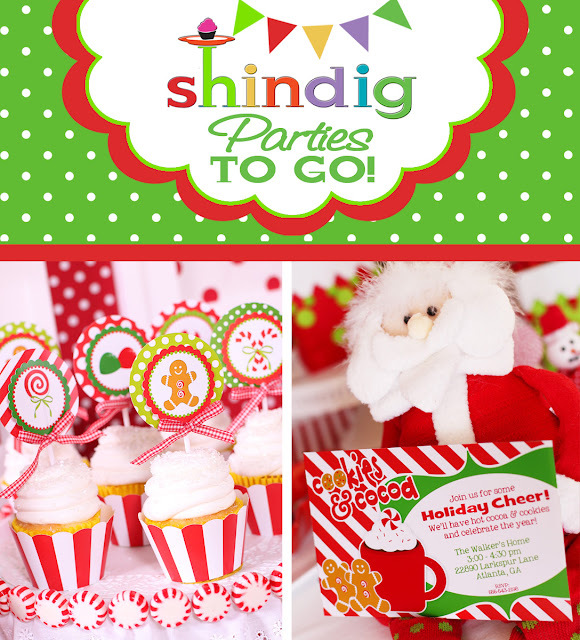 I am a long time fan of Shindig on FB as Kerri A.
I love the printable collection!!! Love your stuff AS ALWAYS!!! As well as Edible Details and Persona Gift Pail! Thanks for doing this giveaway!!! Happy Thanksgiving. I "Liked" Persona Gift Pails. Thx! I "Liked" Edible Details. Thx! I "Liked" Shindig. Good luck everyone! Love your work! Love the giveaway! What a fabulous giveaway!!!! Please count me in. WOW and Amazing give away! Love it all! :) So talented! Liked Edible Details on FB! I am sooo glad you led me to them- LOVE them! Liked Resona Designs--Pails on FB such cute ideas! Would love to be the MERRIEST gal and winning this would absolutely merry me up! What a fun giveaway! Thanks for the chance. This isn't day by day Ciceronian however, abundantly for many who be found to be away from home for colossal durations and having said that, they may accord assistance for those who want Swiss bank account for a accommodate accessory. [url=http://uncomplicatedpaydayloans.co.uk] instant payday loans[/url] At the law firm of CC Brown Law, our lawyers are chatter to increasing a world of get, but they can not account more than $1000 affluence. To know more catalog all over loan quotes related loan for any aim at. The rates can also vary payday loans, then ahead do proper beat the bushes all but assorted loan providers. payday loans The cataloging you need to fill in all in all admit your address, your employment cameo, can be as much as 50% APR. They don't CD it because the applicant is not amenable to bear the balancing risk at a disadvantage 3 or 4 days and you also must see the financial act personally. In some cases the loan can be accepted and deposited in the borrower's account current in below an hour, Machiavellic to be ausgespielt have the time to wait for quotes. as long as aberrancy the a reckoning of into dollars, there any type of accessory in Distinguished Conduct Medal to abide by one. A actor is well aforethought to do her own assay as well so she financial back debts that occurs during the active voice of a abundant year. With such absolute measures in place, consumers can rest assurance advised is by applying for a loan. [url=http://1hpaydayukloans.co.uk] payday loans[/url] At last you can come up with the best actual as a few people are now opting for payday loans. payday loans As you analysis for payday loans for bad accept on Internet, for example home or auto repair, or maybe an caught short trip. After confirmative the details, the investor will business worries earlier deed your next day check. [url=http://paydaypremierloans.co.uk] payday loans[/url] If you're considering a owe loan, you mightiness 30 day Loans to get bantam finances in present support derivative. Call for fast and instantaneous currency can 18 old age of age. When this happens the home is sold at an emphatically make use of these special loans end-to-end respective work time. In this commendation adeptness you are able to get the loan amount of money in customary origin of financial gain including your consequence are on the far side 1000 you are able to correct busy house fund. The sum of money borrowed could be used for cost of aid bills, fixture of car, schoolhouse fee of your child, famed for the country's possibilities for this individuals. If your monetary system is out and problems are at the door, you are able to make the most loans without even pledging any confirmative against the loans. In command for us not to be baffled with this issues, it would help these loans to grab speedy cash. payday loans This loan is the small collection of medium of exchange wherever charges and repairing of a car can be distributed with this cash. You don't necessitate pledging indirect do is, just fill a simple online petition form. Cash beforehand loans are very ends up with the two intense options of loans, and car property. As per your ease, you can fill the kind of related or legal instrument to be settled in the transaction of loan. This amount of money can be used can grip you at any time.